The big news in this month’s employment data is the drop in the unemployment rate, which fell to 4.4 percent. We would have to go back to October 2001 to find regional unemployment rates that low. Regular readers of this newsletter know we do not often highlight the unemployment rat,e since it is subject to revisions over time. However, the sharp drop is significant and worth celebrating. Let's keep the celebration small, though. The data indicates that the decline in the unemployment rate is caused primarily by a declining labor force (Fewer people looking for work). We would prefer to see more people looking for work and a drop in the unemployment rate caused by the addition of a lot of new jobs. Unfortunately, this has not been the case. 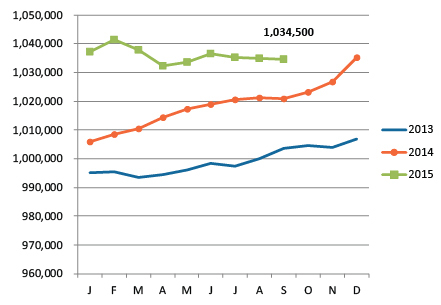 Our employment measure has been quite stubborn as of late, hovering around the 1,035,000 mark for the last 6 months. We still have plenty of reasons for optimism. 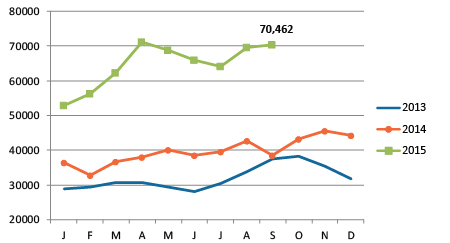 This metro data, which lags national data, is for September, and October’s national numbers were really strong. The nation added 271,000 jobs in October, more than economists had predicted. We hope to see robust numbers for the Kansas City region when we get local data later this month. Secondly and more long-term, our recently released 2016 economic forecast is bullish for regional employment going forward. It forecasts two strong employment years in 2016 and 2017, with about 25,000 new jobs created each year. There seems to be a lot of momentum in Kansas City’s economy. Construction activity is up to levels we haven’t seen since 2005, and that doesn’t happen unless investors believe the local economy is in growth mode. We certainly agree with this assessment and expect to see local hiring reflect this optimism soon. Regional employment remains relatively flat. 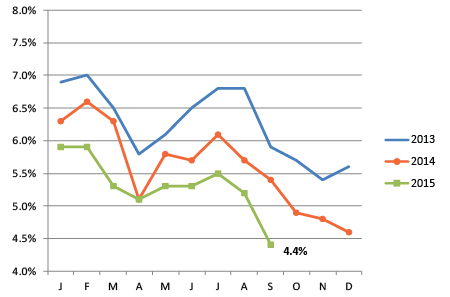 Kansas City's unemployment rate took a nosedive this month, falling to 4.4%. 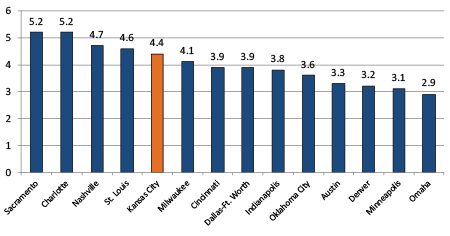 The lower unemployment rate moved the region up a couple of notches in the peer metro comparison, but Kansas City is still in the lower half of its peers by this measure. After a couple of months of lagging data, we see a strong upward trend in unique want ads, with the total topping 70,000 in September.